What is the combat simulator? The combat simulator allows you to conduct offensive and defensive analysis; it can simulate the (more or less) likely outcome of a battle based on the info you provide it with. However, a wide array of factors is taken into account during battles, so the combat simulator is not 100% accurate; it will not give you an accurate prediction of how a battle will turn out. Rather, it will give you a likely scenario. Still, if you know how to read into the information you are provided with by the simulator, you can make valid assumptions then on what you need to do to secure your victory. Such likely paths are: increasing the number of troops, increasing Smithy levels for troops, adding specific units to counter enemy units and so on. There are thousands of variations based on what tribe(s) you and your allies are and what troops are being used on one side and your enemy (or enemies) tribe and troops on the other. To access the combat simulator, you need to have a rally point in your village. The simulator can be accessed from any rally point in any village, so there are no limitations in that area. By clicking on your rally point in the village center (the buildings overview tab), you will access your rally point. It’s logical that the combat simulator is there, since the rally point is a crucial instrument in troop coordination. There are a number of tabs offered in the rally point; the fourth one is the combat simulator: click on it. Voila! You’re there. Now that you’ve successfully located the simulator, we should take some time and explain its basic layout. You will notice that there are two sets of tables: the left one concerns information about the attacker, the right one concerns information about the defender. As you can see, the first pair of tables is larger than the pair below. This is because you will be entering troop information into the first two tables. You are offered with troop types and two text boxes. In the first text box, you should enter the number of troops. In the second one, the troop levels (their upgrades in the smithy ~ the maximum upgraded value of each troops is level 20, as with buildings). The last two troops are chiefing troops and settlers – these do not have levels, so the only text box available for them is the one where you enter their numbers. Using these tables is pretty self-explanatory: if certain troop types are not involved in the attack, just leave their boxes blank. The two tables below require slightly different information to be entered. These refer to other important data which are a part of the calculation of the possible battle outcome. An important factor is the total population of the attacker and defender (not just of the village, but the total pop of the account across all villages). If catapults are being sent, then the attacker has the option to also add the building level of its target and the level of the stonemason’s lodge (if there is one) in the defender’s village. A reminder: the stonemason’s lodge increases the durability of buildings in the village per its level, making other buildings more durable and more difficult to destroy in cata attacks. Both the building level and the level of the stonemason’s lodge are very important for both the attacker and defender – from the attacker’s point of view: he wants to know how much damage he will cause and from the defender’s point of view: he wants to know how much damage he can take before the building is destroyed. Please note that the attacks box (level catapult target) is NOT the box where you enter the attacker’s catapult level. That information is entered in the previous set of tables, where you could enter the number and level of the catapults. The next two boxes on the attacker’s side are meant for hero information. You get to calculate in the heros offense bonus as well as his fighting strength. Interestingly, there are no boxes for hero info on the defender’s side. This does not mean that the defending hero (if he is present in the village and if he is not hidden) will be neglected during the actual attack! However, there are two other factors to enter which are important for the defender and these are the wall level and palace (or residence) level. Both the presence of a wall and residence/palace gives the defender additional defense bonuses. Also, the residence/palace level is crucial in determining the outcome of chiefing attempts. Now, I started explaining the combat simulator from top to bottom, but in reality this is not the order in which you will use the simulator’s options. First and foremost, you will have to set the tribe of the attacker and defender(s). Notice that the tribe selection for the attacker is made with radio-buttons. Why? Well, simply because you can’t possibly have more than one tribe participating in one attack. However, the simulator allows the defender to include the troops of his reinforcements, meaning that you can use all three tribes to simulate a possible defensive army. You can also add in nature troops. Finally, you get to preset the attack type, in the form of a raid or a normal attack. Let’s remind ourselves: the vital difference between a raid and a normal attack is that in a normal attack your troops will fight to the last, ending in either victory or utter defeat. If you’ve sent them on a raid, then they will ‘run away’ if they are overpowered by the defender, so some of them will survive and return home carrying resources they’ve managed to steal. Please note that, in order to change the premade settings of the combat simulator, all you need to do is leave the info in the tables blank and use the final table to enter the tribes of the attacker and defender(s) as well as the type of attack. Then click the little green button below, dubbed simulate. The simulator will then change, giving you the additional tables you need, and changing the tribes of the parties involved. 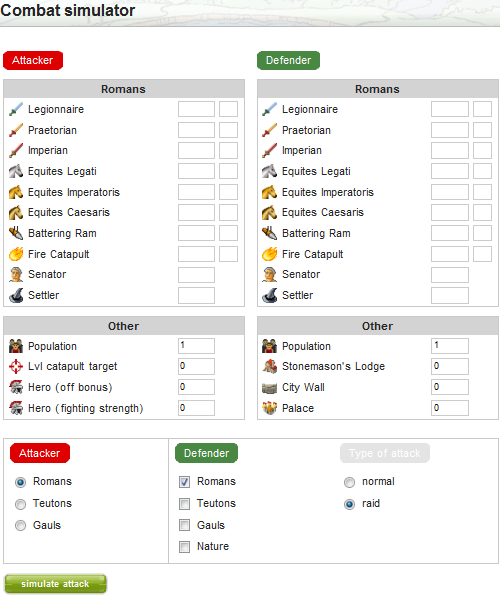 Now you can enter the troop information for the attacker’s tribe and for all three tribes on the defender’s side. When large defenses are made, they usually involve a hefty number of players from all tribes, meaning that there could be (for instance) 6 Romans involved, 5 Gauls and 3 Teutons. Some may wonder, where do they enter all of this different info about all of these defenders? Easy: just as your village overview will show you the total sum of one type of troops, so you will enter their sums in the simulator. This means that you have to enter the summarized troop numbers from all three tribes respectively, regardless of how many Roman, Gaul or Teuton players are participating in the defense. All you’re interested in are the troop numbers. This may be a bit of a pickle, since not all players will have troops of the same level. This is where the accuracy of the simulator goes slightly awry – still, you can just enter the average troop level. Besides, at a later stage in the game, most players will usually have maxed out troop levels. We assumed our defender is Gaul; his troops are also summarized with the number of Gaulic reinforcements. 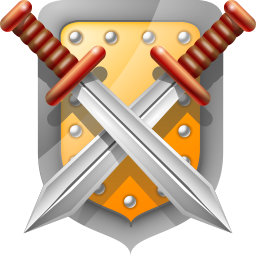 This leads us to the second set of tables for the attacker and defender – the attackers table is the same as it would be if there was an attacker and a defender from just one tribe. However, the defender’s table has changed to incorporate all three tribes. Since our defender is Gaul, you only need enter HIS information! In this case, what’s important is the level of the Gaul’s palisade and the Stonemason’s lodge, if the village is the capital and if there is a lodge built in it. The other wall types do not matter. Once again: just because there are no premade boxes for the defending heroes, this does not mean that the reinforcing heroes will not be taken into effect in the real attack! Moreover, they will have a big effect. After you’re done entering all the troop numbers and levels as well as other information, all you need to do is click simulate. The combat simulator will then show you the outcome it has calculated. Though this info is not completely accurate, you can pretty much deduce what will happen based on it and take appropriate measures in setting up a better defense or offense.